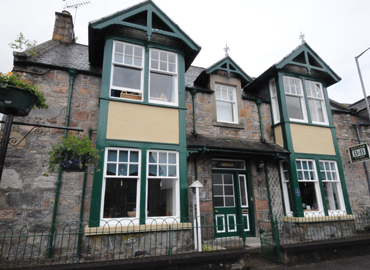 Davaar provides high quality, comfortable 3 Star accommodation within the town of Dufftown. Offering two Double rooms and one Twin/Family room, all indvidually styled and featuring en-suite facilities, a TV & DVD player, Coffee & Tea making equipment and a hair dryer. To help you relax and unwind on your stay, the large guest lounge boasts comfort and entertainment with a TV & DVD player and a vast collection of DVD's. Wi-Fi is also available FREE of charge during your stay. At Davaar, we are confident with our service and have been highly recommended in the multiple publications, including Guide Du Routard, The Lonely Planet Guide and the Michelin B&B Guide. Secure parking is available on the street. For Bicycles/Motorcycles, parking is available within the B&B.